Hotel Rome Wisconsin Dells is part of the Mt. Olympus Water & Theme Park. They promote themselves as the area's only resort with both indoor and outdoor water and theme parks. As the name suggests the hotel décor has a Roman and Greek theme with absolutely loads of activities indoor and out. They are a great family getaway in both the summer and winter months. With plenty of room options to choose from, you can definitely find the perfect place to stay, no matter what your needs and preferences might be. We chose to stay in one of the double queen family suites. It was really large with lots of space for our family and a couple of our son’s friends. We actually arrived about 4 hours prior to official check in. 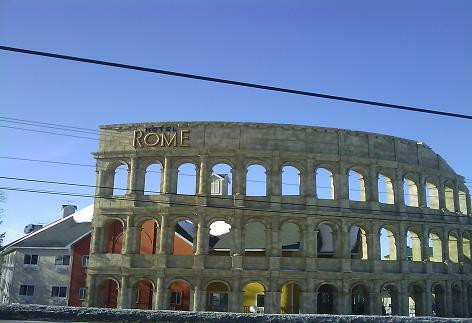 Hotel Rome will give you the theme and water park passes early so you can spend time having fun. Our room had two queen beds, a bunk bed for the kids, microwave, a small refrigerator, a good size TV, and couch. They also have some rooms they call Caesar Suites - 2 bedroom/2 bath. Each bedroom will have one queen bed. The living room consists of a sleeper sofa and a kitchen with oven, microwave and full size refrigerator, three TVs, phone and fireplace. You'll also have the opportunity to have plenty of water fun at the Hotel Rome Wisconsin Dells indoor and outdoor water parks. They feature thirty plus water slides, interactive water play areas for the kids, speed slides, endless rivers and activity pools. There are also heated pools, a surf pool that we thought was a lot of fun, a wave pool and a fast river to play in. The large wave pool was awesome! Our kids of course loved the water park. My husband and I even enjoyed ourselves a lot while we soaked in the Jacuzzi and lazy river. If you and your family are looking for reasonably priced theme park fun, Hotel Rome Wisconsin Dells is definitely a good choice. There's lots to do, and a comfortable suite to relax in once your long day is over. It's a great choice for anyone who wants an entertainment packed vacation and doesn't want to go far to get it.